Republicans, especially Trump supporters, see free trade deals as bad for U.S.
Trade and free trade agreements have had rough goings in both the Republican and Democratic 2016 presidential campaign debates. All of the remaining candidates from both parties have criticized the Trans-Pacific Partnership (TPP), a recently negotiated trade deal between the U.S. and 11 Asia-Pacific nations. A new Pew Research Center survey finds that criticism of trade deals in general is particularly strong among Republican and Republican-leaning supporters of GOP presidential contender Donald Trump who are registered voters. Americans ages 65 and older and men, especially white men, stand out among this group. Although Democratic candidates Hillary Clinton and Sen. Bernie Sanders have both come out against TPP, majorities of their supporters believe trade agreements have been good for the country. 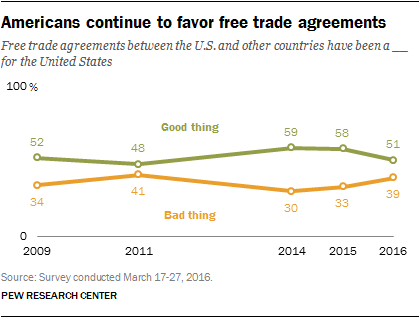 Americans’ positive view of free trade deals has ebbed in recent years: 51% say such trade agreements between the U.S. and other countries have been a good thing for the country, while 39% believe they have been a bad thing. Favorable views of free trade accords peaked in 2014 (59%), and current positive assessments are similar to those measured in March 2011. Views of U.S. free trade agreements are more positive among Democratic and Democratic-leaning respondents (60% good thing vs. 30% bad thing) than Republican and Republican-leaners (40% good thing vs. 52% bad thing). Among registered Republican voters, Trump supporters stand out for their negative view of free trade: 67% of Trump supporters say free trade agreements have been a bad thing for the U.S., while just 27% say they have been a good thing. Republican supporters of Ted Cruz (48% good thing vs. 40% bad thing) and John Kasich (44% good thing vs. 46% bad thing) hold more mixed views. By a 58% to 31% margin, more Clinton supporters among registered Democrats say free trade agreements have been a good thing than a bad thing for the U.S. Views among Democratic backers of Sanders are similar (55% good thing vs. 38% bad thing). Demographically, whites are split: 45% say trade deals are a good thing for the country, 46% say they are a bad thing. Blacks and Hispanics are clearly supportive of such agreements. There is also a gender divide. Women (54% good thing vs. 34% bad thing) have a more favorable view of trade accords than do men, who are split (48% good thing vs. 45% bad thing). White men are particularly critical (52% bad thing vs. 40% good thing). In addition, there are age differences in views about trade agreements. Young people (those 18 to 29) see such accords as positive (67% good thing vs. 25% bad thing). Older people, those ages 65 and older, view them negatively (41% good thing vs. 47% bad thing).